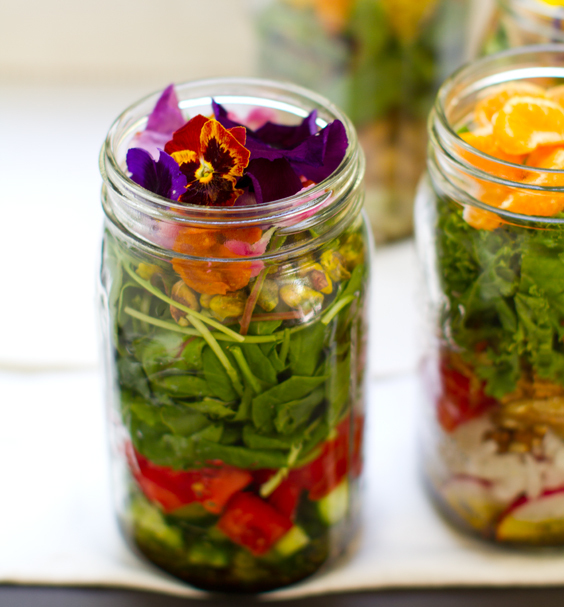 Vegan Salad in a Jar. Make-Ahead Bliss. Salad. In a jar. I totally get this one. A while back (and maybe still) there was a spirited "foods in a jar" trend hovering around the food blogs. Mostly, cupcakes in a jar. And while I love dabbling in cupcake-making, they aren't really my passion. I'll leave cupcakes to a few vegan experts like Erin and Chloe. 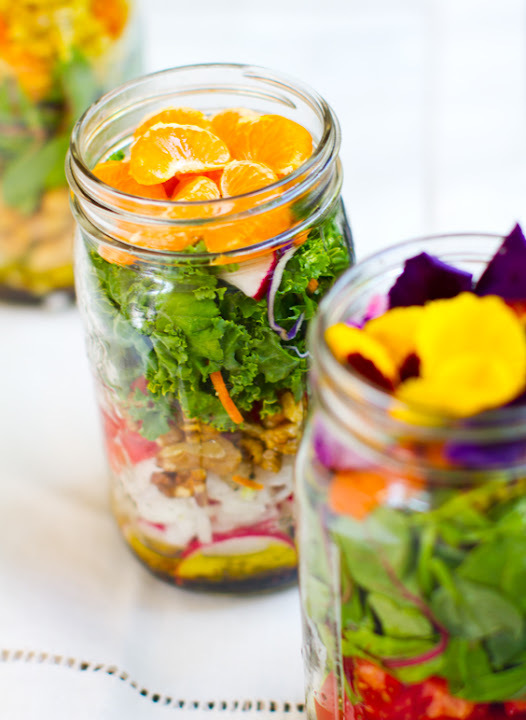 The Daily Muse's post "The Best New Way to Bring Your Lunch" introduced me to the "Mason Jar Salad" concept. 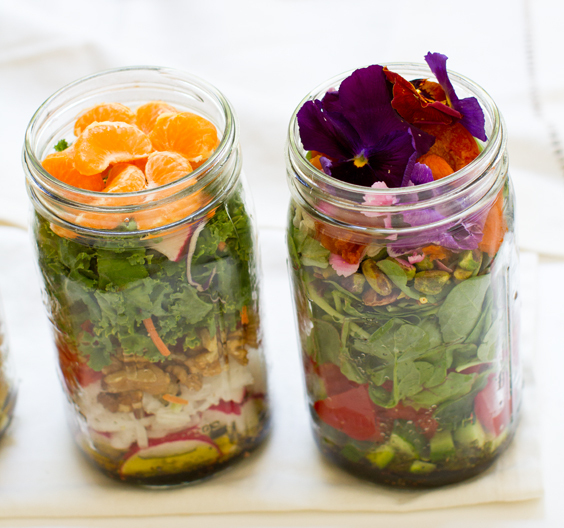 They asked me if I wanted to take a crack at creating some vegan Mason Jar Salads on my blog. My mind was dizzy with ideas. 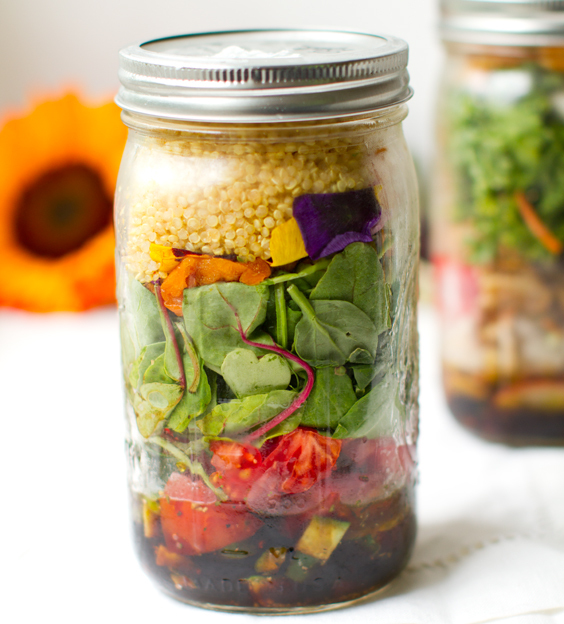 Grains, beans, greens, nuts, seeds, fruit, veggies, dressings .. so many ingredients to layer, stack and arrange. And as I showed in my Vegan Cobb Salad, I love lining salad ingredients up in an orderly fashion. Fresh Factor? So while I was inspired, I was still a tad skeptical. 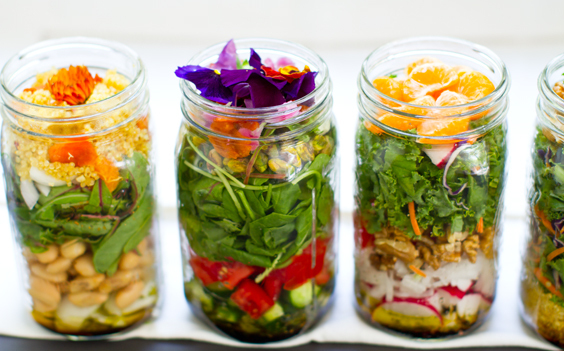 Why salad .. in a jar? Sure, it looks super cute. But what was the practical part of this concept? 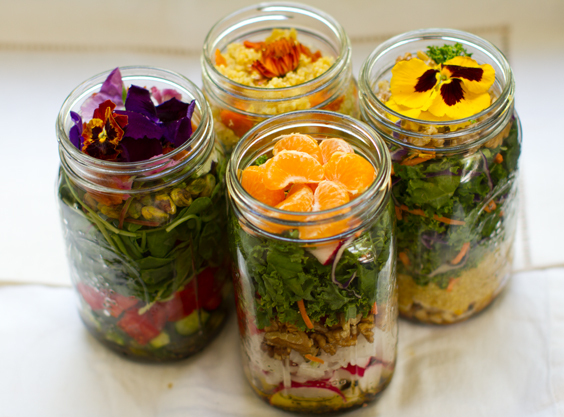 Well, here is what The Daily Muse said..
"The best part is you can make five salads at a time, and they’ll stay fresh for the whole week—just grab and go on your way out the door! 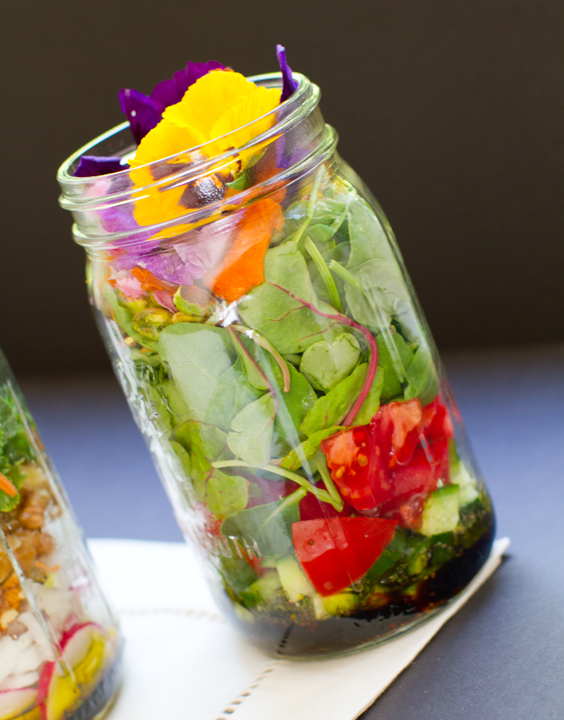 When lunchtime rolls around, you’ll be sitting pretty with your delicious salad ready to be shaken up." ..considering my crazy book writing schedule lately, the part that really stuck out was the "make ahead" concept. Could I really make a slew of these babies on Sunday night - with all my farmer's market produce - and eat them all week long?? Would they really stay fresh? Well just so you know, it hasn't been a week yet. But I'm going to save at least one of my jars for later this week and see what happens. I'll let you know. But as of now these salads look and taste AMAZING. UPDATE: Part Two - the results here. 2) Heavy ingredients that hold up well when submerged in dressing - beans, cucumbers, radishes, onion..
4) Leafy greens/light ingredients that take up a lot of space - spinach, kale, chard, arugula..
6) TOP - colorful ingredients to perk up your taste buds when you pop open the jar - fruit, edible flowers, herbs..
Other: grains and pasta are nice add ins. I like to put these on top of the plentiful salad so that it doesn't get soggy in the dressing but helps to weigh the greens down a bit so I can fit more yummy stuff in each jar. There are no exact "rules" and that is the fun part. Let creativity take over. 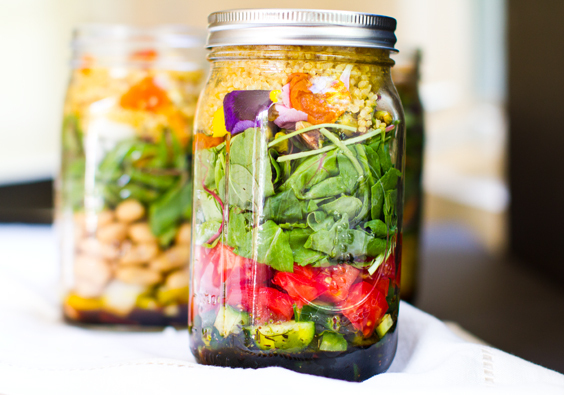 * I made some spicy Cajun quinoa (quinoa + dried Cajun spice blend) for these jars and used fresh farmer's market produce and nuts. * I used balsamic + EVOO + peppercorn spice blend for the dressing in all of my jars. You can try oil/lemon, creamy dressings, tahini/lemon/oil, citrus and more as your liquid infusion. 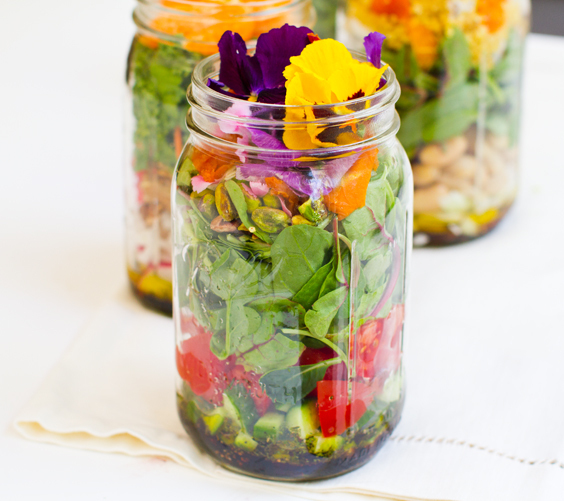 What would you put in your salad jar?? ?